Hi ISTP community, my name is Alix and I am a 7th grade student. For the past two months, I have been working on my Girl Scout Silver Award Badge as part of Troop 60585 in Palo Alto. A Silver Award Project is one of the highest achievements a Girl Scout can earn. It requires at least 50 hours of work and it needs to influence peoples’ lives for a long period of time. 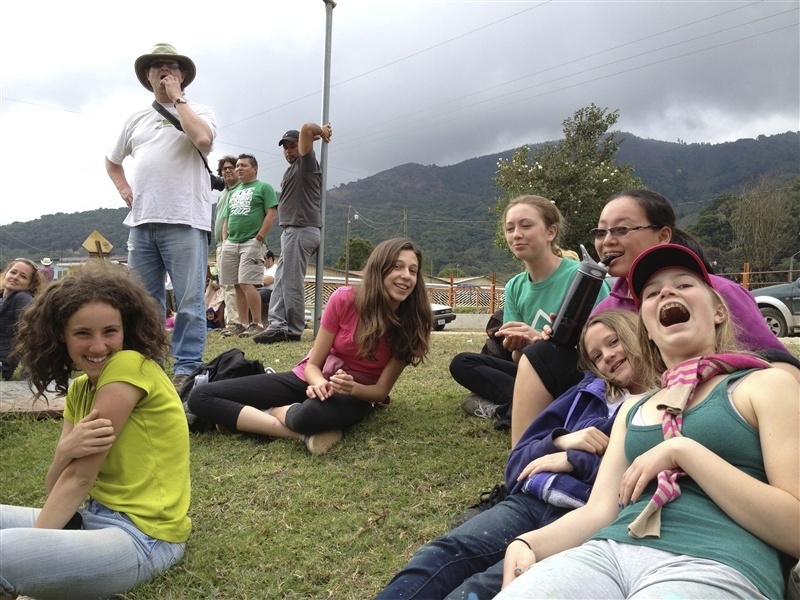 As you may know, ISTP organizes a trip to Costa Rica for the 7th and 8th graders every two years to better understand their culture and help improve the local population’s lives with community service. Sustainable Horizon organizes the trip with the goal to help the community through teaching skills, sharing experiences, and helping with needed work. For my Award, I decided to use our community service trip to help the students in the two towns we were planning on visiting: Copey and La Cima. I needed to have a core theme for the project and then it came to me: I could expand the students’ interest in the English language. I asked permission from Mme. Greiner, Mimi Leary (my troop leader), and different people at ISTP and the local community to help me make the project happen successfully. I started to meet with Monica Martin, our amazing ESL (English as a Second Language) teacher at school, and with Jean François Merckling, the Middle School Dean of Students. Monica and I made ESL games like Bingo, Go Fish, and Memory for the students to help them through their English curriculum. The entire ISTP community also contributed to a very successful Bake Sale to raise funds to buy needed ESL materials, school supplies, and sports equipment for the 2 communities. The teachers and I really appreciated everyone’s spirit and contributions! I also sent emails to Roselyn Nair, the Assistant Store Manager at Office Depot in East Palo Alto, and to Bart Peterson, the Community Marketing Manager at Sports Authority in East Palo Alto, to ask for donations for our required supplies. Roselyn Nair offered us very nice discounts for glue sticks, pencils, pens, markers, highlighters, scissors, and many other school material that we often take for granted in our society. In total, we left Palo Alto with seven Bingo games, four Go Fish games, two Memory games, school materials, soccer balls, and volleyballs for both communities. When we arrived, in Costa Rica on April 10th, we decided to present our donations on our last day. On Monday, April 15th, we presented the students the ESL game materials and played some games with them so they would know how to use them after we left. The students in Copey and La Cima, Costa Rica were so happy with all the gifts that they rewarded ISTP with a certificate signed by Seidy Rodriguez, the Program Director of the Copey Learning Center, and Gloria Gamba, the Assistant Director. They were so glad to receive such presents and teaching assistance from all of us. We said our goodbyes to Copey and La Cima on the last day and thanked them for the wonderful time we shared together in their village. Overall, this trip was very successful and very well organized by ISTP and Sustainable Horizon. Find out more about Sustainable Horizon at www.sustainablehorizon.com.